I finally hit the $10K mark in a month with Merch By Amazon. Yippee!!!! In this podcast I talk about what I did to achieve that and also comment on the “Merch Is Dead” rumor that seems to be flying around. congrats on your success! that’s truly amazing. Congrats on your success. Thank you so much for this podcast, especially about the FB groups and the negativity. I needed to hear that today as I have been a part of some of those groups and after reading the posts, it can seriously mess with your outlook. You reminded me to get back into my own lane and be creative! Thanks for the encouragement. You’re welcome Scott. Negativity is the devil of online biz. It robs you of energy and outlook. While people are complaining about the issues with Merch, I’m growing my empire by diversifying. We all have a choice about what we want to focus on every single day. I choose positivity. It leads to productivity. Good luck! Thanks Lisa. I could not agree more. A quick question for you. I am considering singing up for your course The Merch POD Brainstorming Boot Camp Course. I just made it to the 100 Tier on MBA and I use Illustrator for my design work. Will this course be beneficial for where I’m at? Also, I heard mention on your other podcasts (faithful listener) that you were doing a private FB group. Is that still part of the package with one of the courses? Many thanks! Indeed. Just to be clear. It’s not a design course. 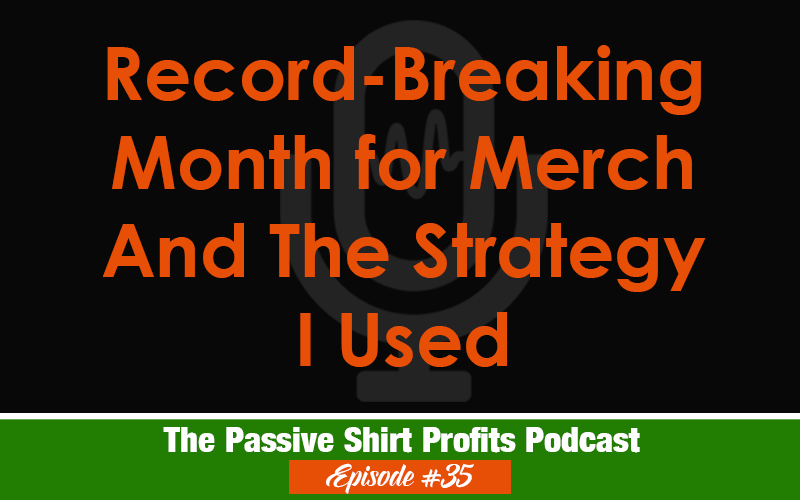 It’s strictly keyword strategy and idea focused to help you get more organic sales on Merch. It doesn’t cover design. My only course that has anything to do with software is the Photoshop course. But yes most students that buy seem to be on the 25 to 100 tier when joining. All students get access to my private FB group for more help and I’m also happy to review your shirts privately if you want. As of now, I am not charging extra for that and many students who start selling more seem to like that benefit because it’s often easier to learn by seeing what you did wrong and how to correct it. Hope to see ya in class! Joining the class right now. Thanks again. See ya in class!! 🙂 Thank you Scott! OK I know this was just an example buy what kind of conversion ratio is realistic for Merch by Amazon? There is no way to know. Completely depends on the design, traffic, etc. it varies so much. Could you tell me what you have been getting? There’s no way to know. Amazon doesn’t give us traffic reports. So without that I don’t know. All I know is when I have a shirt that is selling multiple times per day it is typically because it has a higher than average click thru rate than competing shirts. So shirts that sell well have a better click thru and that means Amazon is more likely to rank it well and also promote it in other areas. But there’s no way to know what your click through rate is specifically. Congratulations, Lisa on your milestone achievement! I got accepted on the platform back in January, and I’m currently tier 100. However, I haven’t quite figured out pricing shirts. Some people have said to price low (gaining only a penny) in the lower tiers until you reach tier 500. Others have said Amazon actually wants you to price high and they are more likely to push your design if you do. I’ve got a hot shirt selling frequently at $17.95, but it’s because I’ve been promoting it like crazy on social media and it affects a relatively small group of people. Otherwise, most of my designs haven’t sold anything. Any tips on pricing? I actually price higher than a lot of people. 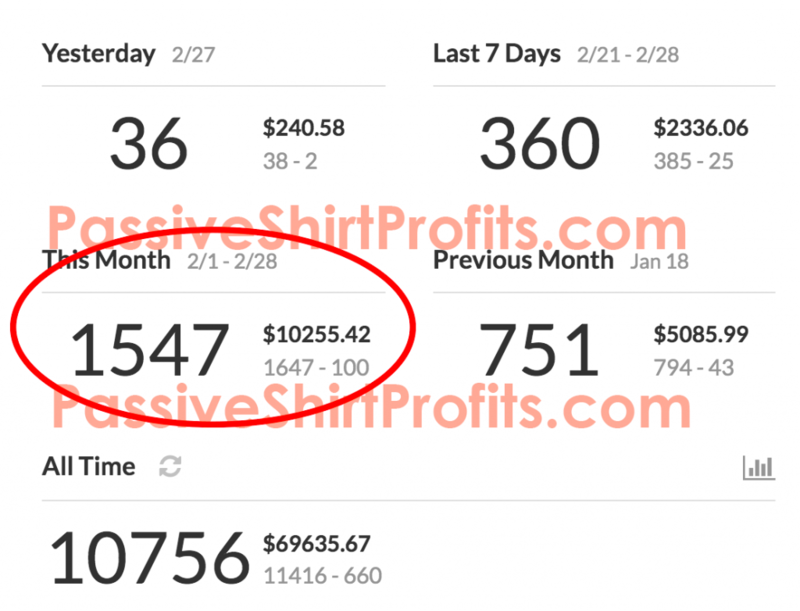 In February, another big part of my big month was selling shirts priced at $22, $23, and $24. I understand the price low strategy you mentioned, and it can work but I don’t think it’s always best. I think CONVERSIONS matter more than price. So if your shirt is still converting well (good click to buy ratio), Amazon will rank it well and promote it in other areas (checkout process, etc) no matter the price. I had a shirt selling very well at $19.99. I raised it to $23.99 in January and it sells just as well at that price. So the bottom line is, if the shirt converts well, Amazon will rank it and promote it elsewhere inside the checkout process. So I really think it depends on the conversions and not just price. In other words, a $17.95 shirt with a 75% conversion is better than a $21.99 shirt with a 13% conversion. Try raising your shirt price a dollar at a time and see what happens. That’s what I typically do if I want to see how high I can go on a particular shirt. I’ve also found that the more niche the shirt is, the more you can charge. My highest priced shirts are to very specific people where there is less competition. Thanks Lisa for the reply! I’ll give it a try.